The weird news of the week is filled with unexpected consequences, or possibly karma. Great Britain sent their Olympic team to Rio all together in a chartered British Airways 747. The team arrived back home at Heathrow Airport Tuesday morning to a hero’s welcome -and a delay at baggage claim. Not only did the team travel together, they were all outfitted with matching red luggage. 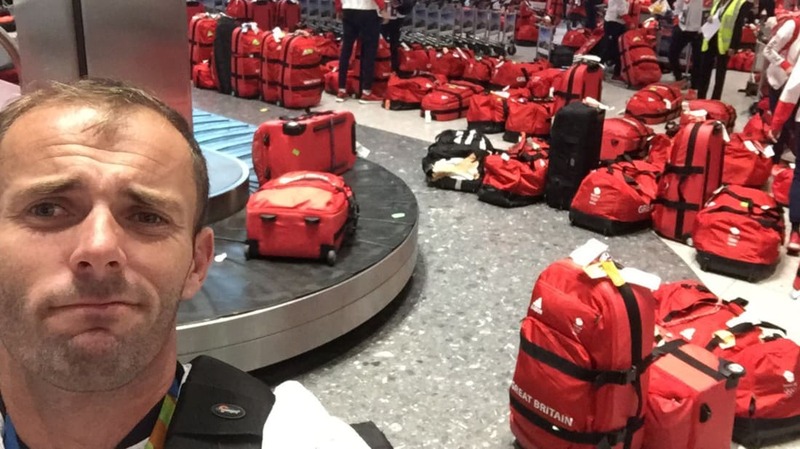 All the backpacks, duffel bags, and suitcases were red with black straps and had Great Britain printed on them. It took about two hours for all the athletes to find their bags. Grant Birdsong, a 22-year-old student at the University of Pittsburgh, was trying to impress a woman he just met by jumping from one rooftop to another in Pittsburgh on Tuesday. He didn’t quite make it. Instead, he fell into a narrow space between two buildings, slid three stories down, and became stuck. Emergency personnel estimated the space he fell into was between 16 and 18 inches wide. A rescue crew spent four hours trying to rescue Birdsong, and eventually broke through the brick wall of the Qdoba Mexican Grill to free him. Birdsong suffered a broken ankle and some minor injuries. There’s no word on whether the woman was impressed with his stunt. Raymond Mazzarella of Pittston Township, Pennsylvania, was upset that his neighbor’s pine tree was dripping sap on his car. Saturday afternoon, he took a chainsaw and cut through the tree’s 36-inch trunk. The massive tree fell on Mazzarella’s apartment building, rendering it uninhabitable and leaving five people homeless. Police said Mazzarella was being checked out at a hospital. Upon his release Monday afternoon, a neighbor saw Mazzarella trespassing near the apartment house and called police. When the neighbor confronted him, Mazzarella punched him. The neighbor pulled out a stun gun to protect himself. Mazzarella then started hitting him with a baseball bat. The Red Cross is providing the other apartment residents with temporary housing. Alattin Erdal and his wife Asiye, of the Tekirdag province in Turkey, threw a dinner party in celebration of regaining their health. The family of four had earlier suffered from a case of food poisoning after eating one of Asiye’s meals, and had to spend a week in a hospital. The celebratory dinner party for twenty, which included an animal sacrifice, ended when the guests all showed signs of illness. Everyone present was taken to a hospital to be treated for food poisoning. Mrs. Erdal said she has become much more careful with food preservation after the two incidents. Nancy Knauss of Fresno, California, owns a 100-year-old tortoise named Touche. She’s had him for almost 55 years. One day a gardener left the gate to Knauss’ yard open, and Touche made his escape. Knauss posted fliers around the neighborhood and asked for help on social media to find Touche. But Touche had other plans: covering the distance of more than 11 football fields a day, traveling over 6.5 miles from her home in northeast Fresno to Gettysburg and Hwy 41 in only 10 days. The 100-year-old, near-sighted tortoise had found a friend. Steven George says he spotted it at his neighbor's house climbing onto a domed mount over his neighbor’s water pipe. George checked social media for lost tortoises and contacted Knauss, who was grateful to be reunited with her pet.